“Intermission” is actually a fun little story. It starts off with Anakin and Padme reporting to the Jedi Council about a recent trip. For a minute, they make it seem like they run into a Jedi fighting another Darth, only to reveal it’s a play, and the trip is to visit a famous actor. This leads to some fun panels and mash-ups. But there’s something sinister about what’s going on, and Padme and Anakin uncover a deeper mystery, which leaves off for part two. Aside from that, I like how the narration from Anakin conveniently leaves out the romantic parts of the story. The artwork is good, and coupled with the story, it’s a good match. Tales From Wild Space: “A Small Push” is an interesting one. It starts off with everyone treating this little girl really bad. They say the worst things to her. I mean terrible. So you have this little Twi’lek girl who has been abandoned. We don’t know why, but it looks like she’s not doing that well out on the streets, and she’s not getting my on charity as no one likes her. She comes across a tooka cat…and she tries to kick it or stomp on it. It’s not clear, but the artwork definitely gives the impression of violence and malevolence. It’s a dark turn, one I didn’t see coming. But the tooka does escape. However the kid falls off a cliff and is now hanging on for her life. Depressed as she is, she thinks she’s getting what she deserved. Then Mace Windu shows up and saves her. He gives her some good words of wisdom, and show her some kindness. It’s enough to turn her around, and the last panel shows she did just that. She started saving tooka cats and paying it forward. But there is a cryptic line by Mace. He thanks her, but the girl doesn’t know what for. The writer doesn’t explain it. It’s left as another mystery. So two things here. First off, they mysteries in this story really have my interest. Why did this girl’s mom abandon her? Why does everyone hate her? What did Mace mean when he thanked the girl for her help today when he was the one who helped her? Will we ever get answers to those questions? The mystery is compelling. On one hand I want the answers. On the other hand, the story can leave them unanswered, and the mystery actually adds something to the story, rather than taking away. The second thing is the depth to the story. I mean this one digs into some deep topics of abuse, bullying, depression, mental scarring, and misplaced violence. Those are very deep topics for kids, which is who this comic is aimed at. However, they’re very relevant and important topics. Kids need to know about those things, and they need hope and positive messages about how to deal with it. 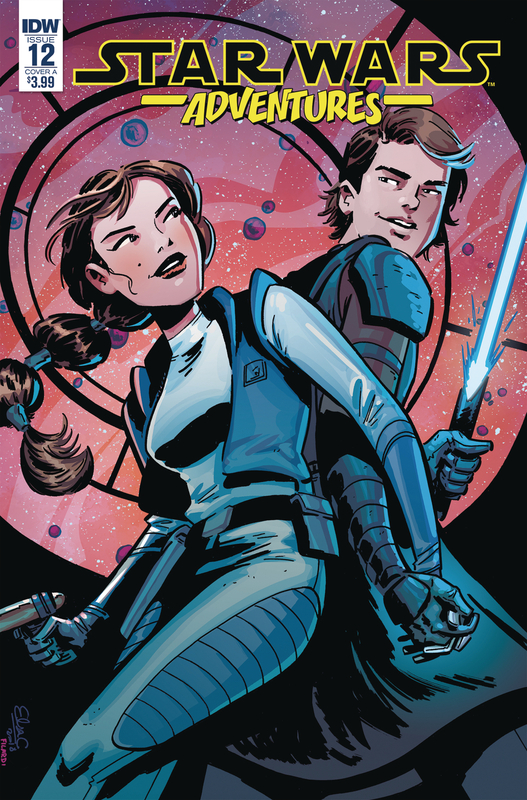 The ambition of tackling those topics, and wrapping them up into this neat little story…well hats off to Scott Peterson as it’s one of the most meaningful Star Wars Adventures stories I’ve read yet. This one easily earns a five out of five metal bikinis.